Hypoxic Ischemic Encephalopathy [HIE] or Neonatal Encephalopathy [NE]? 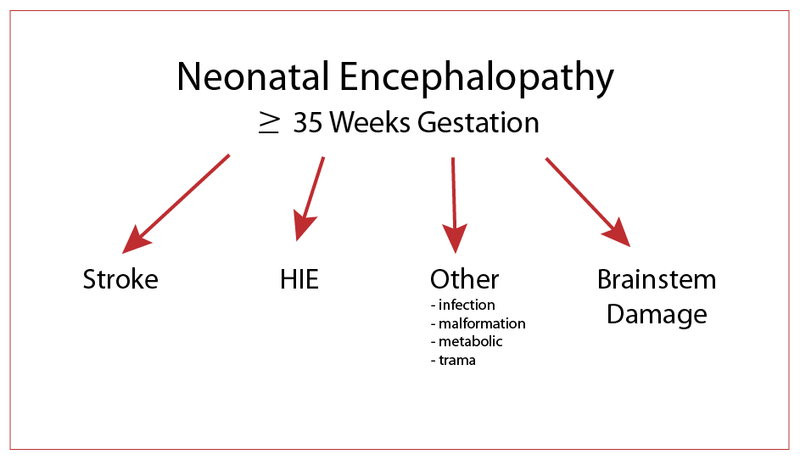 You have heard me argue against using generic terms like Cerebral Palsy as a final diagnosis, so you may be surprised that I am favoring the newer term Neonatal Encephalopathy [NE] over the more generally used HIE. Both NE and CP are generic terms. Just as the types of cerebral palsy can be broken down into different descriptors, so too can Neonatal Encephalopathy. In the diagram you can see that neonatal stroke, HIE, brainstem damage, and a wide group of other causes such as infection, brain malformation, inborn errors of metabolism or even trauma can produce a similar clinical presentation. These babies, born at greater than 34 weeks gestation, have alterations in consciousness with stupor or coma and/or seizures. Brain scanning is very helpful in this group of babies. It often enables an accurate diagnosis of the type and distribution of brain injury. A note of caution. The early scans give a good start on the diagnosis, but often it is the later scan, several weeks or months after birth, that is a more accurate predictor of outcome. Each of the subtypes of NE produces a different type of adverse outcome. Neonatal stroke probably has the best recovery with the expected outcome a full-term pattern hemiplegia that affects the hand, arm, upper body and speech more than the leg. This pattern is more complex and difficult to deal with than a preterm pattern hemiplegia, but all but a fraction of these children score at GMFCS Level I-III. (Do Brain Scans Improve Diagnostic Accuracy?) this means that they will be able to walk and be functionally independent. Functional arm and hand use is usually more of a problem than the leg. The good news is that with proper and consistent use of thumb/wrist bracing and intermittent Bilateral Hand Arm Intensive Training [HABIT) and Constraint Induced Movement Therapy (CIMT), the future is much improved for this group of babies. HIE is a diffuse injury to both sides of the brain and produces quadriplegia with all four limbs involved. The most common cause of HIE is prolonged, partial asphyxia. Clinically, there is often a history of late pregnancy or intrapartum problems that result in decreased oxygen and/or blood flow to the baby’s brain. We see the most evidence of damage in the gray matter at the watershed areas between the anterior and middle cerebral arteries. This is the most vulnerable area to damage at or near the term date. The brain responds to injury by swelling and in some cases, the swelling may be short-lived and have little long-term consequences. Newer treatments, like cooling, have demonstrated improved outcomes. On the GMFCS, children with quadriplegia are at highest risk with only 25% reaching the level I-III severity. Approximately 75% score in the Level IV-V range, using wheelchairs and/or walkers for mobility. These children have more problems as so many more neurologic systems are involved. In addition to gross and fine motor impairments, these children may have continuing speech/oromotor issues, vision, hearing, seizures and cognitive issues. In my experience, the outcome depends both on the amount of brain damage and the amount of remaining undamaged brain. Recognizing the variety of potential problems a child may develop should not be considered just a discouraging list, but a guide to obtaining the best, earliest interventions from experts in the relevant areas. The key thing to remember is that the brain keeps recovering over the first 3 to 4 years and it matures over 20 to 30 years. The children who have a quadriplegia pattern with all four limbs involved from the “other” causes like infection, malformation, trauma or various inherited metabolic problems also need a multidisciplinary approach. They tend to be diagnosed bit later in life – some have had a relatively normal neonatal period and are only picked up with the generic diagnosis of developmental delay later in infancy. Some of my colleagues argue that the clinical/laboratory presentation is enough to make an accurate diagnosis in these children and they do not advocate brain scanning of these later diagnosed infants. I strongly disagree. In these babies and infants, brain scanning can identify areas of damage and subsequent risk, but more importantly the scan will show the extent of apparently normal brain. Accurate knowledge can help guide the treatment plan. When I first worked in the NICU, 60 to 70% of surviving babies with CP had both the quadriplegic pattern of involvement and were severely involved. Now, approximately 20% of children with cerebral palsy have quadriplegia and the severity is much less. There is hope for further improvement with a wide variety of interventions as they grow. Next week I will write about brainstem damage leading to Athetosis or Choreoathetosis in survivors. If you are new to this Blog and have a child with cerebral palsy, I suggest you read the current series, of which this post is number 4. It is important that parents understand the range of diagnoses and impairments in the CP spectrum to better able you to talk with your therapists and physicians. The goal is to move towards lesion-specific therapies. I would ask to see a speech therapist and a neurologist for a diagnosis. “Brain injury” is non-specific. You should also have his hearing checked by an expert. Hope this helps.